atLEAF CHL PLUS is a powerful, handheld, easy to use device for noninvasively measuring the relative chlorophyll content of green leaf plants. Chlorophyll content can be an indicator of the plant’s condition. Each performed measure has associated device time and sensor temperature (*). 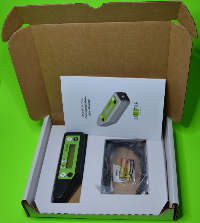 Each atLEAF device is assembled, tested and calibrated in the United States.